What happened to me? I’m sure everyone is long gone 8( But I’m back, I’ll make sure to win your hearts again! So, let the fun begin! 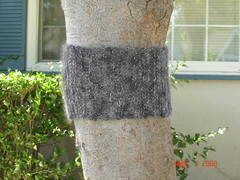 I joined and am mod’ing another Traveling Scarves group on Ravelry, remember this is the type of group you join, typically with at least 10 other members. You knit small portions of each other’s scarves and send onto the next. 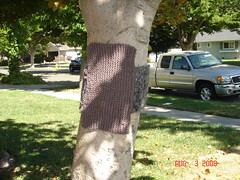 Before you know it, your scarf comes back to you having been a small seedlet last time you sent it, now it’s a full fledged scarf. I’ve participated in 2 of these prior and got 2 great scarves out of it, not to mention I enjoyed the social part. 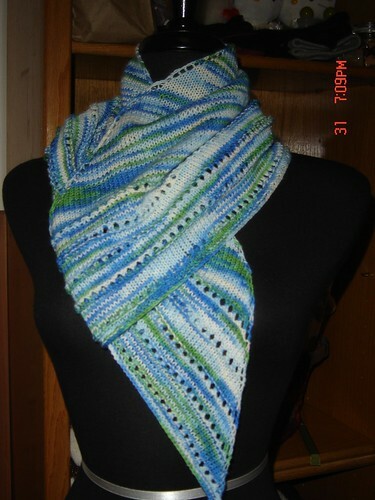 Here’s a couple of scarves I just sent a few weeks ago, they really are pretty. Aren’t they gorgeous? 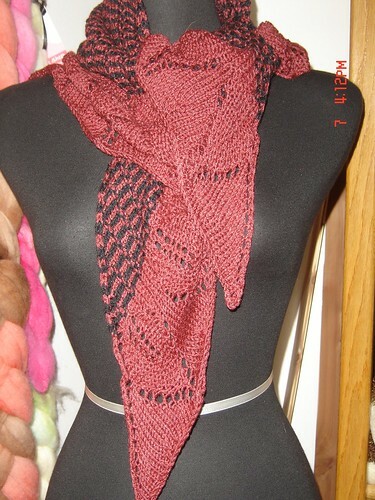 This group is lengthwise scarves, #78, and for the top picture, I added Fiesta sock yarn, in Rhubarb colorway, it blended in pretty well. 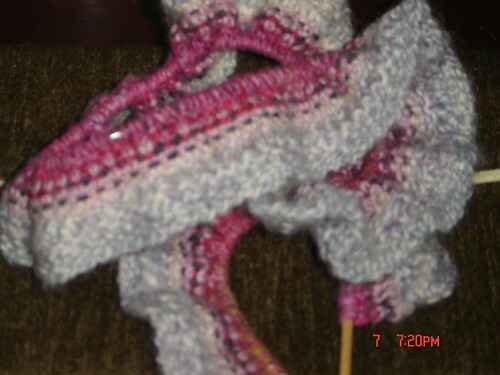 The pink one I added Noro silk, don’t know the colorway, it really blended in well. Ooh! 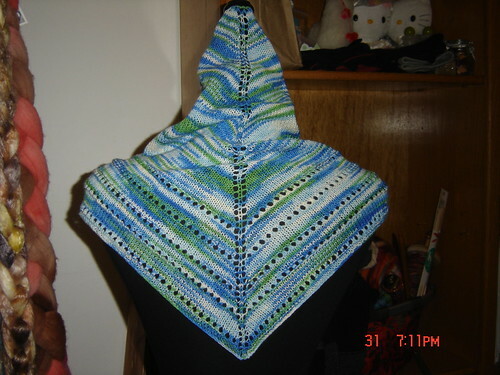 And and FO, a fun and such pretty one! 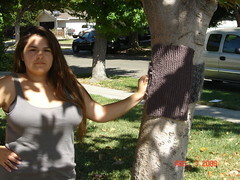 It’s Mary-Heather’s pattern, Simple Things, knit with Scout’s Swag sock yarn in, ?? ?, gosh!, brainfart! Ok, let me think, it is “Tidal Pool”, I think, it’s just beautiful. This was made for my spoilee in the Twilight Edward vs. Jacob Eclipse swap, Vberry. These are her favorite colors, some of them at least, and I swear, it reminds me of the ocean. It’s knit with the full skein of Scout’s wonderful yarn, I had been loving this yarn for so long, one that I had got in Scout’s Swag Sock Club from I think it was 2009 or 2008, not too sure on the date. I was so happy to send this gem on. But wait, you think my present is nice, Vberry returned the favor twice over. This was her gift to me, an Ulmus! Just look at these colors! I absolutely fell in love with it and cant’ wait until the weather gets a little more chilly so I can strut this gorgeous thing. Isn’t it beautiful! 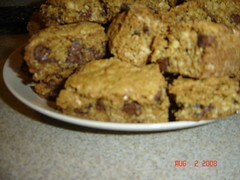 So no more “bad blogger”, I’m in full blog mode now, so I’ll catch you Wednesday! 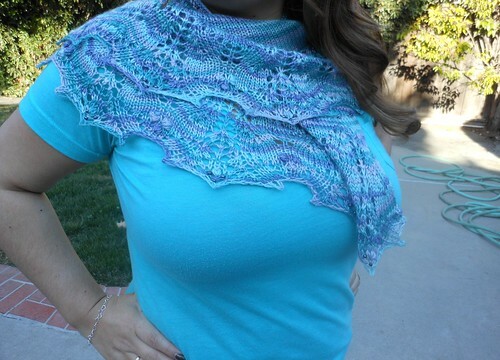 Since I'm talking about Stitches West, last year I saw Jennifer Hansen from Stitch Diva Studios there demonstrating her stash busting Tunisian blanket, which was totally gorgeous! I quickly bought the Jenkin's Tunisian Crochet hook in S with a stopper, thankfully, her blanket was such a hit that Jenkin's has these on back order still because of demand. 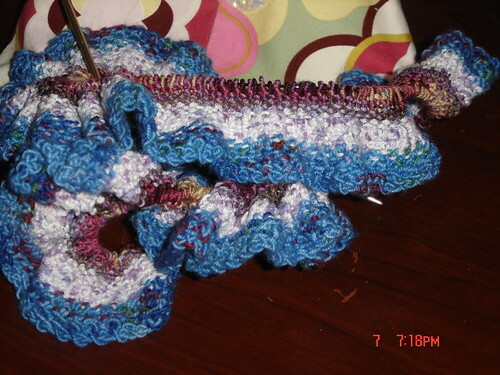 After Stitches I went to a knit along for this blanket at Knitting Arts and started my blanket. 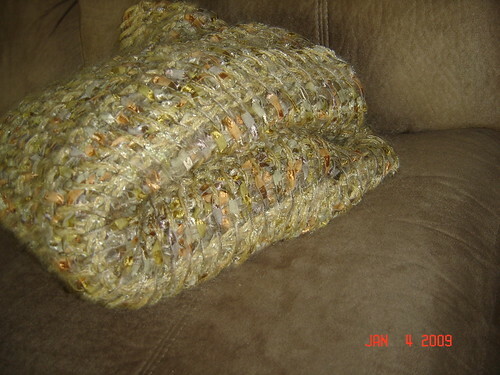 I worked on it and found the method very easy and great "mindless" crocheting, or a cross between crocheting and knitting. I finally finished this, and am so proud of it. I love it so much. 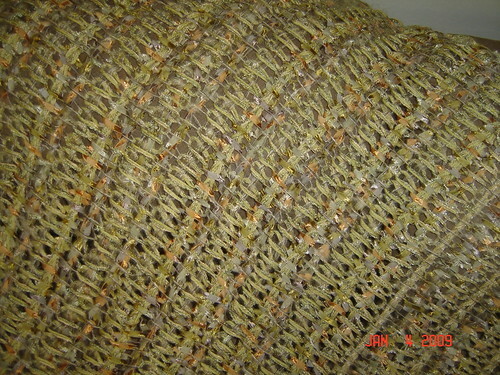 There are 9 different yarns in this, including Alpaca silk! 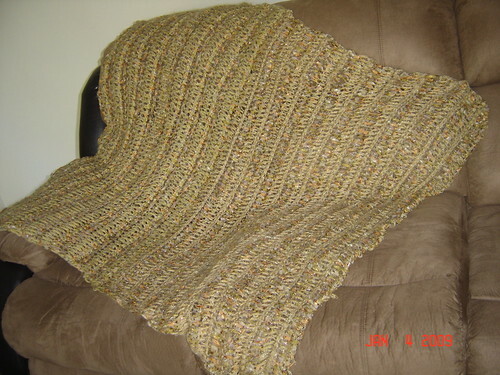 It's so soft, and warm, this is fast to make if you actually spend the time working it, for me I put it away and finally decided to bring it out again. I've been steadily knitting along on my Tech Square Afghan blanket, and finally, oh finally finished my Pocket Square! 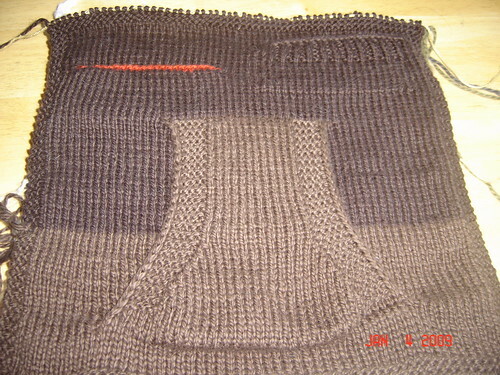 There are 3 pockets to it, a Kangaroo, Ribbed, and Pouch pocket. All are different methods and pretty darn interesting. I went on faith when following the directions, and thankfully the designer didn't fail. 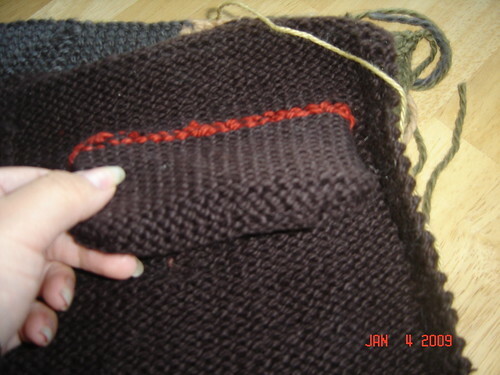 This is the Pouch Pocket, the angle is looking at the inside or opening, that is lined with Red yarn. To start it off you take waste yarn and knit 2 rows of X amount of stitches you want for your pocket width, and then continue re-knitting the same stitches of waste yarn with the working yarn, and continue on your piece. 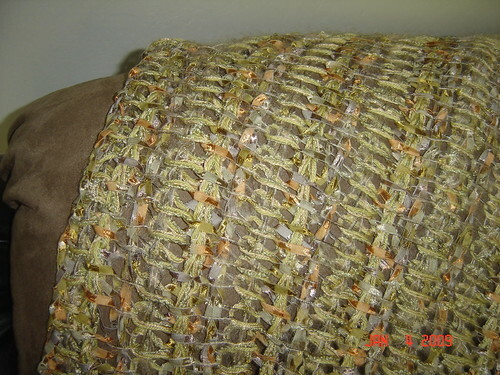 When your ready to work the pocket, you remove the waste yarn, leaving 2 rows of live stitches, top and bottom row. 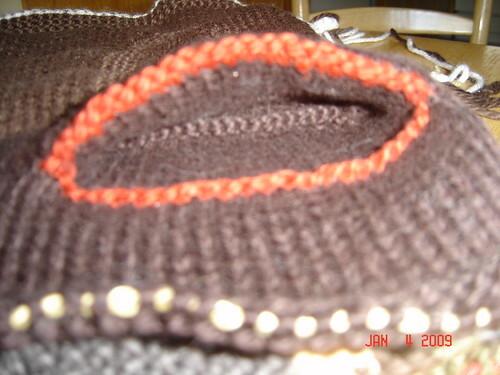 You take these stitches and knit in the round, picking up a stitch at the corners to close the gap, and knit for however deep you want your pocket. 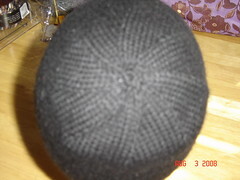 You knit in stockinette so when you push the pocket inwards, it's knitted inside. 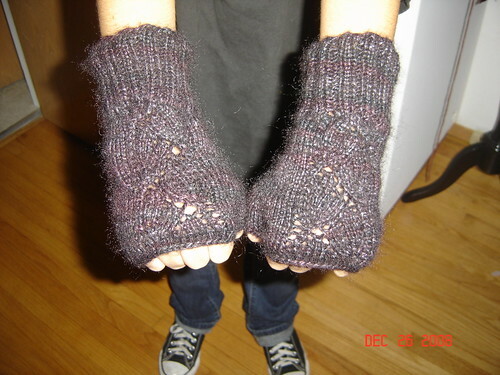 The last pocket is a Ribbed square, you do a YO every other knit stitch, and then the next row you knit the knit stitches and transfer the YO's to waste yarn. 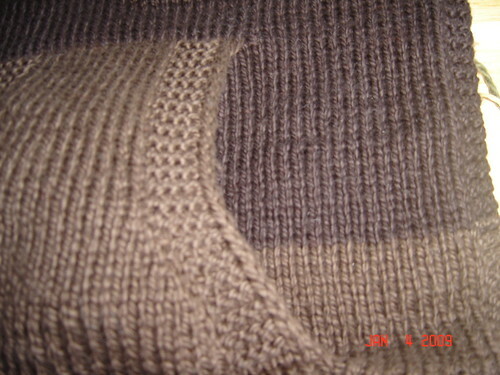 When your've ready to knit the back of the pocket, you knit the YO's thru the back stitch, knit tightly, and keep going until you've reached the ribbing. 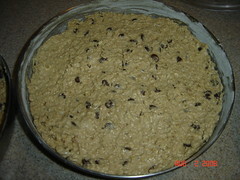 You then seam up the sides. Out of all 3 pockets, all methods are pretty interesting, I like the Pouch pocket for being a loose change pocket, you really can't loose anything in it, the Ribbed one is nice, but you need to seam nicely, and the Kangaroo I love, very pretty and so many designs you can incorporate with it, I just don't care for picking up stitches on the purl bump side. I was so happy to finish this square, it had be hibernating for awhile because I was knitting other things or got stuck in the holidays. 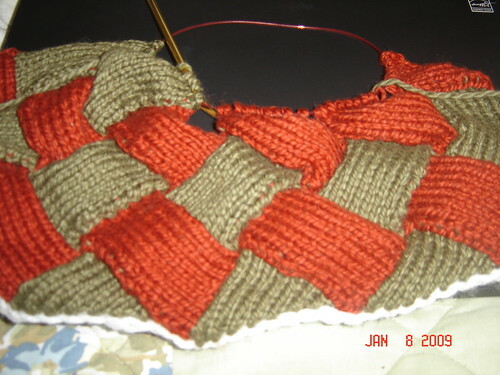 I quicky cast on for my next square, the Entrelac square. 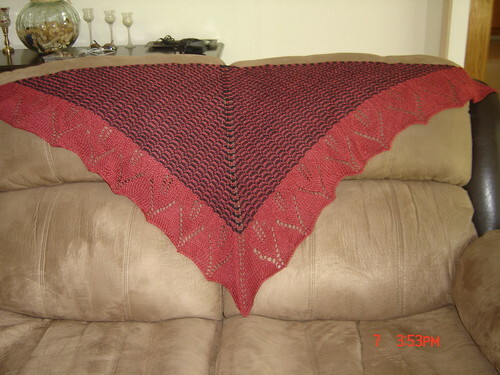 I've made leaps of progress with this, almost done, but need to buy more yarn. It has 2 of my fave colors, green and red, oh my! I've never done Entrelac before, this is my first attempt, and I admit when I was first looking at the instructions, I was like, WTF, but mainly because the picture was far more confusing then the actual method. Anyways, I followed the instructions like a good little knitter, and sure as day, was speeding along in no time. This is why I love this project, you get something of everything and your smack ready for a real garment, like a sweater, or vest. I'm loving the color combo, my hubby picked the 2 to go with out of my entire color scheme. 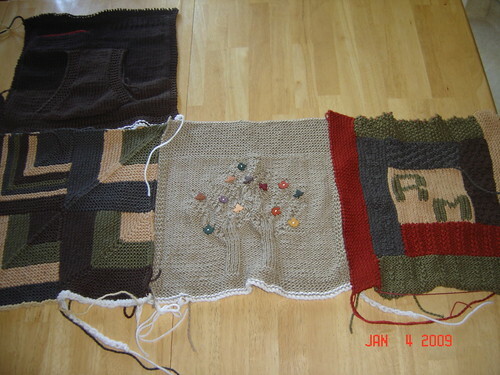 So far these are all the squares I have done, the Entrelac is not shown yet cause it's not yet finished. 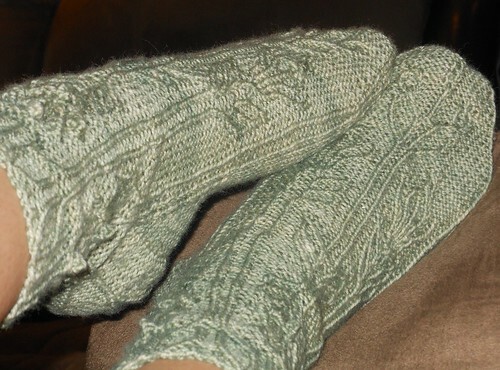 I also participated in a Christmas Stocking Swap with Yarnwhisperer on Ravelry for the Death By Socks group. 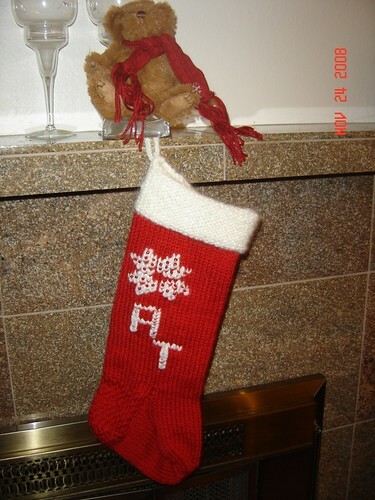 All the members thought it would be nice to knit a stocking, no competition, but a way of knitting something nice for someone else. 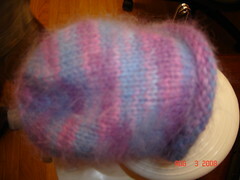 I love the stocking, good color choice, and I love the Noro Kureyon Sock Yarn! 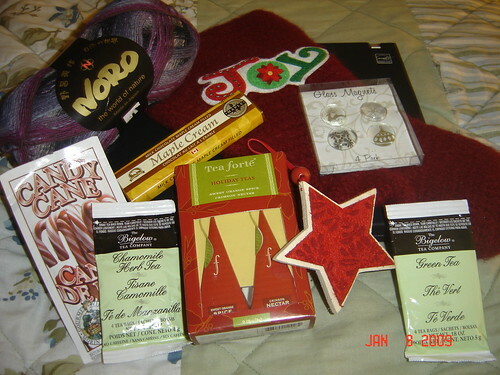 All the goodies she sent, plus the lovely magnets and ornament. 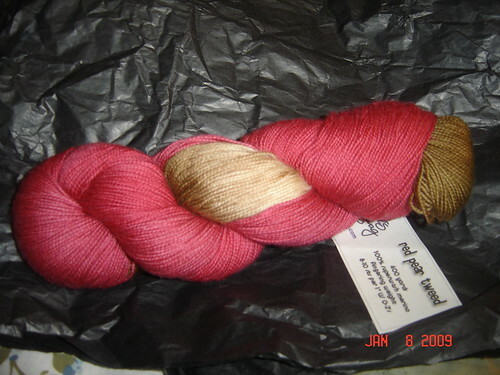 Oooh.. and last, but not least, I received my Scout's Swag shipment, "Red Pear Tweed", I'm loving this color! Great for the upcoming Valentines day! Phew! Sorry for the long post, but gosh I just needed to share all this, I have more, but I'll spare you and save it for another post. All my peeps, this is going to be a lengthy post because I'm just "All Over the Map" with great news, FOs, Yum-O treats, and anything else that sneaks into my post. If you haven't already read or heard from "Scout" followers like me, is that Scout from "Scout's Swag", has signed a book deal to share, inspire, and teach all inquiring "dye-minds" about the "Dyeing" process. 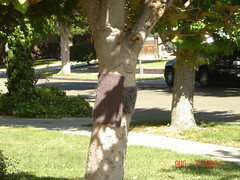 That is taking pure undyed wool and dyeing it into your own unique colorful yarn. I've actually known about this for awhile, but I had to keep my lips sealed until Scout made the secret news public. When I took Scout's dye class awhile ago, she revealed the great news to her dye class students, and asked that we keep it on the down-low until her announcement, which came this past weekend. She announced it during a Y-Knit Podcast, which I have to say is a very good one. WonderMike & Stephen really are just wonderful with their Podcasts and Scout's Podcast has alot of good info in it, as well as info about her upcoming book. Did I also mention that she is a photographer? She takes the most beautiful pictures too. physics behind food & he's goofy funny. Giada's food is just perfect. It's always simple, elegant, and tasteful. 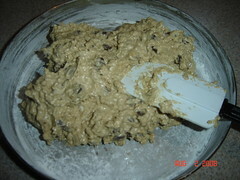 I've cooked her recipes time and again, and there always delicous. I'm Mexican, but Italian is really my other love, right next to Mexican food. 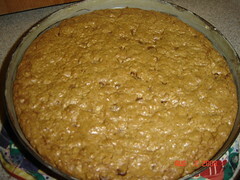 ~~Rachel Ray "30 minutes Meals"
"I love your recipes". 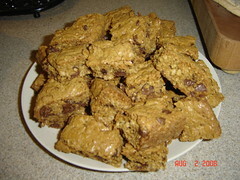 Her recipes are quick and Yum-O! awesome drinks to go with her dishes. I love her methods, and her presentation. 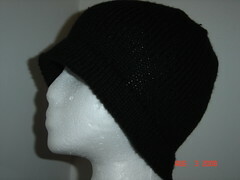 I knitted the "K & K Cap" from Purlescence Yarns awhile ago, it was my first hat/beanie that I knitted. 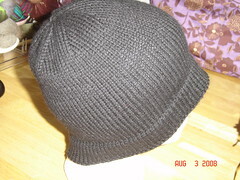 I used Cascade Cash Vero yarn in Black, and was just really proud of how it came out & how comfortable and soft it felt. 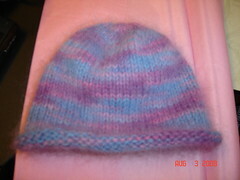 Another fave of mines is this "Baby Purl Beanie" that I knitted using Lorna Laces Angel yarn. I can't remember the color, but it's just precious. I gave this as a present to my close friend/family for their new baby girl. Whew.. now that's the end of this post. Tell me what do you prefer, short or long posts? Or are you in between? I prefer long, I read all sorts of blogs daily, so I like to have something to read, it's my version of the "morning newspaper". Well folks, I'm adding to my arsenal, 2 NECESSITIES for any yarnaholic, like myself *-) I've been wanting to make these purchases for quite sometime now, and what drove me to actually making the buy? 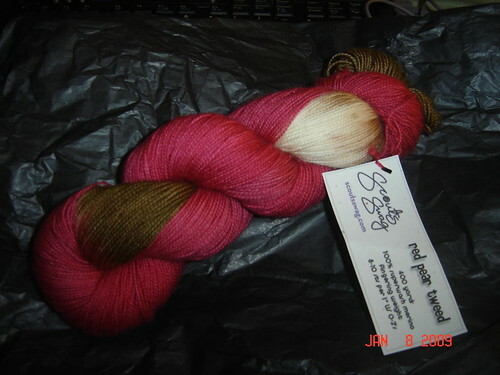 Well the last straw came this weekend when I bought Scout's newest Swag in Peach Pit, and of course it came in a beautiful braid/skein, and I loved the color so much that I started to knit the Elm Row pattern I just purchased from Knitspot. Anyways, since I don't have a winder, I decided to manually wind the yarn into a ball, I wrapped the skein around a chair, and started winding. I was ok for a minute (I've done this before with no issues), and suddenly started running into all sorts of problems. Well several pain staking hours later, there I was caught in tangle after tangle after tangle, ruining my new precious Peach Pit yarn. I was able to carefully get rid of a majority of the tangled mess without ruining the yarn, and by the time I was ready for my next class, I was down to a small amount of tangles. 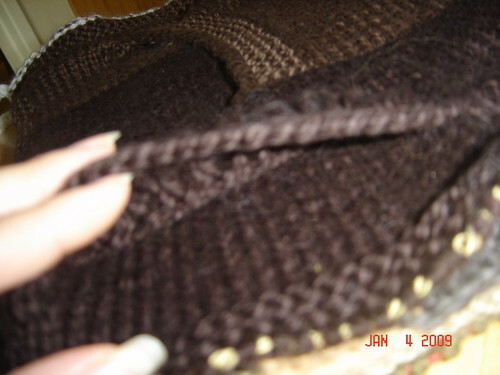 By this time I was tired of dealing with it, and made the decisive decision to cut the thread, although reluctantly. So, after this disaster, I've made the purchase, and will be getting these 2 new treasures to add to my arsenal in my "Mini-Fiber Studio" I'm putting together. I can't wait for these to arrive! I'll be ready for any skein that comes my way! 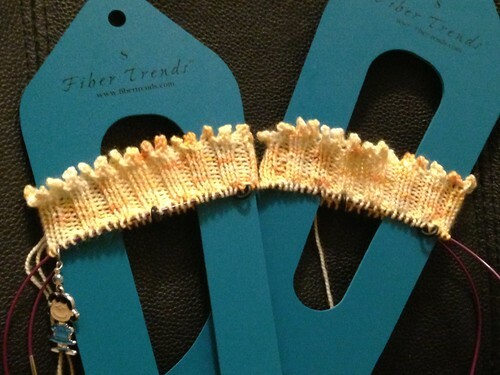 When I think of all the yarn cakes I can make with these 2 tools, ahh.. I'm in heaven! I did do some searching on pricing, and found that VillageSpinWeave had the best deal, offering the Umbrella Swift & Plastic Ball Winder as a bundle, great pricing! I know I sound crazy, but if you've ever had precious yarn in a tangled mess, you feel my pain.